How much physical activity should we have? According to the Centers for Disease Control and Prevention, children and adolescents need 60 minutes of physical activity each day. The bulk of the activity should be aerobic (walking, running or other vigorous activity), with some of the 60 minutes spent on muscle strengthening (pushups or gymnastics) and bone strengthening (jumping rope or running – for 3 days a week). Adults need about 150 minutes of moderate physical activity each week. You may be able to identify several barriers to getting in the recommended amount of physical activity in each week for yourself and your children. Time – it’s difficult to find consistent times every day when family schedules are already full. Sometimes it can be a challenge to find an activity that the whole family can become involved in when there are varying ages and ability levels. Or maybe you feel like fitness centers and exercise equipment is too expensive. There are ways around each of these barriers…. What can families do together to become fit? Here are some ways to build physical activity into your family’s daily activities, and some suggestions for new activities together. Small bits of time are OK. Try 10 minutes of activity at a time. If you cannot find an hour in the schedule, can you squeeze in 10 minutes here and there? Turning off the TV and other electronics might free up enough time to get moving. Can you walk or bike somewhere close by instead of driving? Play together – have a family game of ball, chase each other around the yard. Even just putting on some music and dancing around the house can be a fun way to incorporate exercise. Plan a family activity each weekend – like going to the playground or taking a nature hike. Explore different types of activities to help kids find something they (and you) enjoy. If family members want to play video games – make it an active one and have a tournament taking turns. Work together – You can make housework fun and active by putting on some of your family’s favorite tunes and dance while you clean. Yard work can be a great way to be active as a family. 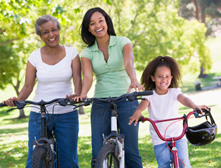 Set family fitness goals – Track your progress with a family log. Get pedometers and county your steps. You can even increase your levels and set higher goals. Celebrate with a fun activity when you reach a goal. Written by: Shannon Carter, Extension Educator, Family and Consumer Sciences, Ohio State University Extension, Fairfield County, carter.413@osu.edu. Reviewed by: Lisa Barlage, Extension Educator, Family and Consumer Sciences, Ohio State University Extension, Ross County, barlage.7@osu.edu. I really like the content of the article and all the topics covered under this article content is engaging and informative.